One of the best ways to protect yourself from serious injury when you are involved in a motorcycle accident is to have the right riding gear. Arguably, the most important piece of protective gear is your helmet. However, choosing the right helmet can be process. I’ve even heard it said that choosing your helmet can be as confusing as choosing a bike for some people. I don’t know about that statement, but with all of the choices of helmet manufacturers and styles it does take some research. Arai Helmets – Popular among racers, this company is a multi-generation helmet maker, with decades of expertise. Scorpion EXO – On the other end of the spectrum is innovation. Engineering excellence by world famous designers. Shark Helmets – Over a quarter century of experience, this company was founded by professional racers. Speed and Strength – One of the fastest growing brands in motorcycle apparel. Each part of a helmet has a specific role in protection. The shell – provides protection from objects that would otherwise penetrate into your head. It also provides protection from abrasion as your head glances off a surface, or if it skids along the pavement. Shells are made from lightweight but strong materials such as plastic or fiberglass composite. The most expensive helmets utilize carbon fiber or Kevlar, which is the material of most bullet proof vests. Crushable Foam – Moving inward, the interior high density foam layer is is probably the most important layer in case of a crash. It is a rigid material but is designed to be crushed. The ability to be crushed provides a method of absorbing and dispersing a blow to your head in order to reduce trauma to your brain. It is important to know that while a helmet eases the high impact to the brain, it does not completely stop the action that can cause a concussion. A concussion occurs when an outside force causes your brain to hit hard against your skull. The trauma from this sort of whiplash action of your brain against your inner skull causes damage to your brain. My recommendation is to make sure the helmet fits your head shape. The firm inner foam dictates this aspect more than any other part of the helmet. Manufacturers have different shapes within their lines, and some manufacturers may offer shapes that fit your head better than others. Comfort Padding – The layer closest to your head is the comfort padding. This has the important job of making sure you have a snug fit, so the helmet doesn’t move on your head as you ride. Trying on multiple helmets to see which is most comfortable to you is worth the effort. It is what you will be most aware of in your day to day helmet usage. When trying on helmets, shake your head from side to side and nod up and down. If the helmet moves, the fit is not snug enough. When you find a good snug fit, wear the helmet in the store for a while. If after several minutes you feel any tingling or discomfort, the helmet is probably too tight. Ask the retailer how much the comfort padding will compress with wear, and take that factor into account. Chin Strap – The chin strap is more important than you may initially think. It’s purpose is not just to keep the helmet from coming off; when it is cinched down, it keeps the life saving materials in place during the high impact of a collision. Faceshields do provide a level of safety beyond just wearing goggles or glasses. Stop and imagine what difference it may make if doing a face plant onto the roadway going 40 miles an hour. Also consider the distraction of a bug in the face. A big enough bug can actually cause you to lose control of your bike and have a serious accident. Helmets are divided into full-face and open-face style. More than a windshield, the full-face helmets have a wrap around shell that protects your jaw in the event of a crash. The see through shield, or visor, can be purchased in clear or it can have various levels of tinting. Many have removable, interchangeable visors. Open Face helmets come in three main varieties: 3/4, 3/4 flip up (aka modular), and 1/2 helmets. I’m sure you can guess which is safest. The 3/4 flip up provides some jaw protection with a shell that extends across the sides of your jaw, and incorporates a flip up visor. The 3/4 helmet protects three quarters of your head, but has nothing for your face. It and the half helmet (covering only the top half of your head) rely on goggles for eye protection while riding. They are great for feeling the wind in your face on the open road, but offer little protection in an accident. 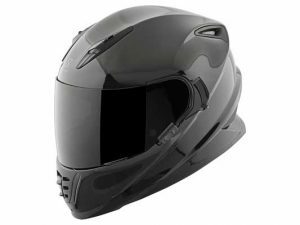 What Does a Good Motorcycle Helmet Cost? Because they may be the difference between walking away from a crash and being wheeled off, much has been invested in researching the safest way to design and manufacture helmets. Not surprisingly, these costs are passed on to the consumer. That said, you can still get this life-saving piece of equipment for under $180. It is best not to go cheap when purchasing your helmet. You get more quality and more protection when spending a little more, as a rule of thumb. Cost is a combination of manufacturer, retailer markup, and the area in which you live. You may also save money buying last years model; allowing you to step up to a better model. I don’t keep up on the latest helmet designs as closely as your local motorcycle equipment dealer. For that reason, and the variables in user preferences, I won’t make a specific recommendation on which helmet to purchase. I will tell you to make sure you ask your retailer about safety ratings, certifications and latest advancements. Also, purchase only a DOT-approved helmet. If there is something you don’t understand about the helmet that they are trying to sell you, or something doesn’t sound right, be sure to ask questions until you are satisfied. If you still don’t feel right about what you are being told. Don’t hesitate to find another dealer. We are talking about a life and death purchase when you buy a motorcycle helmet. A helmet should be replaced every 4 years or so. Those polymers and foams can become less effective as time goes by. If you drop your helmet or hit it on something it can also diminish the effectiveness of the injury protection. It should go without saying that your helmet must be replaced if you get into an accident and there is ANY sign or suspicion that the helmet was hit. Helmets are only designed for one major impact. If you are involved in an motorcycle accident, Pennsylvania motorcycle accident lawyer Lee D. Gaber can be reached at 888-292-5352 (888-Cycle-Law) 24/7, 365 days a year. All Pennsylvania consultations are free with no obligation to pursue action.